One award show down, two more to go. Last night the 69th Annual Golden Globe Awards were handed out by the Hollywood Foreign Press Association. It was a fun night celebrating excellence in both film and television. 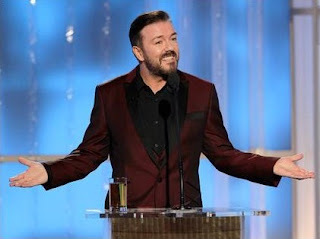 After much hoopla about Ricky Gervais returning as host, it was actually a rather tame evening. Our master of ceremonies certainly got in a few zingers in his opening monologue, but nothing that, I think, will cause the kind of (unjustified) backlash that happened last year. Thankfully, there were no superfluous tributes or clip packages, so the show clocked in at the intended three hours (inclusive of a fun, sung banter between married presenters Felicity Huffman and William H. Macy). And as for the awards themselves, there weren't too many surprises (look for some commentary below, though) so let's just dive right in with the best part of Sunday (besides the Giants' divisional win over the Packers!!!) - the fashion. We'll begin with a couple of young ladies who looked terrific. Modern Family's Sarah Hyland (above left) wore a blush lace vintage Dolce & Gabana gown while The Descendants' Shailene Woodley (above right) chose a soft silver Marchesa dress. Both ladies looked sweet and fresh, simple and age appropriate. Both dresses were sophisticated and fitted enough to say, "I'm a young woman, not a girl," but tasteful and modest enough to keep a little innocence and not make them too tarted up. A couple of couples. Michel Hazanavicius and his wife, Berenice Bejo (co-star of The Artist) looked glamorous and happy at the Globes, particularly after Hazanavicius's The Artist took home three awards (Best Score, Best Actor in a Comedy and Best Comedy). Meanwhile, a cane-assisted Brad Pitt looked happy with his leading lady, Angelina Jolie, who was wearing Atelier Versace. I think Jolie is looking too skinny these days (to the point of unhealthy) but it was a pretty and soft dress that stunned without much fuss. Not everyone looked great. Zooey Deschannel wore a custom Prada dress that, along with her 60s-mod hair style, looked like a costume. The dress with a more modern up-do or that hair with a trendier dress might have worked, but together it looked like she was attending a costume party, not an award ceremony. And Sarah Michelle Gellar (above right) looked ridiculous in Monique Lhuillier. She mentioned on the red carpet that her toddler daughter chose the dress. It's no wonder: the blue and white tie-dye mess looks like something a toddler might color and hang on the fridge. Next time, Gellar should have a stylist chose her dress, not a three year old. The men looked wonderfully handsome. 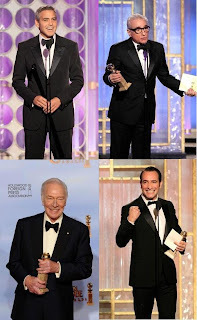 Winners George Clooney, Martin Scorsese, Jean Dujardin and Christopher Plummer looked incredibly dashing in their classic tuxedoes. Idris Elba (at right, on top) changed it up a bit by wearing a tuxedo that had some visual interest to it and Owen Wilson (at right, on bottom) changed it up a bit by opting for a tie instead of a bowtie. 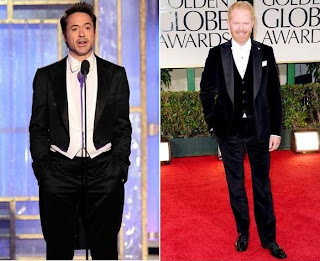 And having a little fun with the tuxedo option, Robert Downey, Jr., and Jesse Tyler Ferguson (both below) wore tails, something we don't see much of these days. 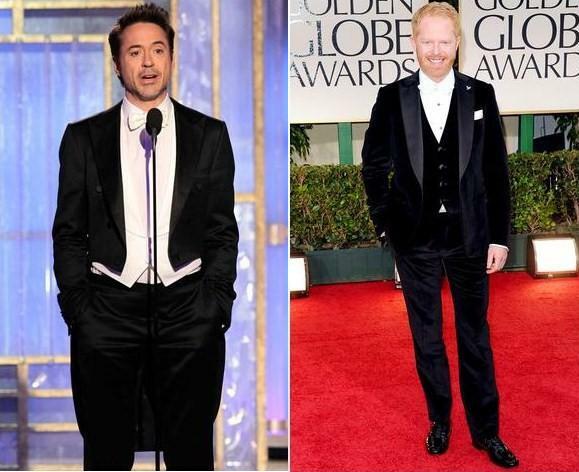 Then of course there were two of my favorite actors looking absolutely fabulous. 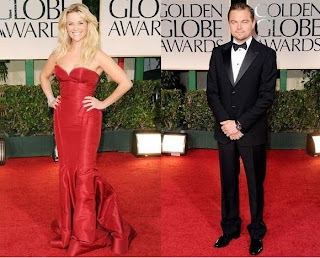 Reese Witherspoon looked smokin' hot in her structured, firey Zac Posen gown, complemented by her controlled bed-head hair. And my pick for best dressed man of the night is my favorite guy, Leonardo DiCaprio. He looked classic and pulled together, with a bit of what has become his standard scruff. The talented actor looks better and better everytime we see him. Can we please get these two on screen together? And finally, I thought Tilda Swinton looked terrific. Seriously. The structure of her attire mixed with her tall, striking frame, plus knowing she has an off-beat style, made this powder blue number work. Way to take a risk! Of course that's not everyone who attended. Visit E! Online for tons of photos, and tune in to E! tonight for Joan Rivers's Fashion Police. I thought Albert Brooks was great in Drive, but I also thought Plummer deserved this for this terrific, underseen film. This was unexpected, though not entirely underserved. Yay!!! I'm a recent Downton convert, and the second season, which began last week, is off to a great start. If you're not a fan yet, what are you waiting for?!? Is this a joke? I haven't seen Boss so I suppose I should withhold judgement, but really? Over Steve Buscemi in Boardwalk Empire? Boo. This had to win. The scores to the other movies were great, especially Howard Shore's score for Hugo, but the score in The Artist made the film, so good choice, HFPA. My favorite part about this was Seth Rogen introducing Williams as a nominee, saying, "Michelle Williams, from the hysterical comedy My Week with Marilyn." Really, how do they categorize some of these things?!? You may think I'm upset that Aaron Sorkin and company didn't win for Moneyball, but you would be wrong. In the Globes, there is no distinction between original and adapted screenplays, and I really liked Midnight. Kudos to Allen on one of his best films in a long time. I'm thrilled over this. Though I think Alexander Payne did a phenomenal job with The Descendants, Hugo was magical, due in no small part to Scorsese's skill and care as a director. Yay! There was a moment when I thought the awful New Girl would win, since the HFPA likes to be the first to pick up on new things, but this was the right call. And what an hysterical speech by Steve Levitan and Sofia Vergara! The deserving winner gave a lovely and heartfelt speech (especially the part where Dujardin thanked an agent for making him prove the agent wrong), and I liked his "silent" moment at the end! I liked that Ms. Streep commented about the wealth of great roles for women in film this year. I haven't seen the film, but knowing Streep's track record, I'm going to go on a limb and say this award is derserved. Viola Davis won at the Critics Choice awards so it's shaping up to be a showdown between these two for Oscar. Our best predictor will be whoever wins the SAG award in two weeks. Keep watching! There wasn't a lot of suspense here, although Midnight in Paris could have easily won and I would have been just as happy. It's George's year. This is his best performance to date, and while all the other nominated men (Leonardo DiCaprio (J. Edgar), Brad Pitt (Moneyball), Ryan Gosling (The Ides of March) and Michael Fassbender (Shame)) also gave phenomenal performances, Clooney's the one who will be giving lots of speeches this award season. Right choice. I'm guessing it'll be a battle between this and The Artist come Oscar time; both are great, but I'm rooting for the epic and classic family drama. And there we are. 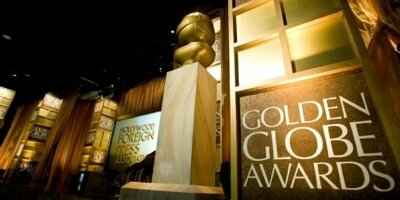 The 69th Annual Golden Globe Awards. Don't put away your dresses just yet - the SAG Awards are just two weeks away. Tune in to TNT on Sunday, January 29 to find out which actors are honored by their peers.